Exquisite acoustic renditions of classic Rolling Stones songs, so were James Lee Stanley and John Batdorf, purveyors of acoustic rock music for decades. They took 11 Rolling Stones classics and turned them into something totally unheard of. You don't have to live in California or play acoustic guitar to be enchanted by "All Wood and Stones" ... an amazing collection of Rolling Stones tunes played on acoustic guitars and brimming with joyous vocal harmonies. In August of 2003, I got the idea of recording a CD of my favorite Rolling Stones songs. But i wanted it to be a collaboration, not a solo CD. I began nosing around to try and find someone that I'd like to work with who's singing knocked me out. A mutual friend suggested that I contact John Batdorf, as he lived only a few miles away. It was kismet. I hadn't seen him in twenty years and we fell together as easy as if we were always going to make this music. John is not only a consummate professional, but one of the most talented musicians I know. A great singer and guitar player and he has incredible ears and timing. Great fun and it's always challenging to play with him. He is from Ohio, but has been out here in California since the late sixties. I met him in 1970. He played and sang on my first two albums for RCA. He had a group called Batdorf and Rodney on Atlantic, Geffen and Arista, that did acoustic rock music. Then he was in a band called Silver, after which I lost track of him. It turns out that I was always hearing him but didn't know it. He sang on several jingles that we all heard thru the years, after which he did source music for "Touched By An Angel." He and I reconnected fortuitously for the All Wood and Stones project and it was a full collaboration. We sat in the studio and worked out two acoustic guitar arrangements of our favorite Stones tunes. We both come from that acoustic rock music ala Buffalo Springfield, CS&N and the Eagles. Vocally, I am a little like Crosby and John is a little like Stephen Stills/Graham Nash. So it was natural that we would be fans of those acoustic guitar bands. On "Last Time" and "As Tears Go By" we wanted another voice to change the texture of the vocal sound and I called Timothy B. Schmit (Eagles). He and I have been friends since we played together in St. Louis when he was in Poco, around the time of "Crazy Love." We stayed friends thru the years and he's sung on many of my albums. Timothy has never done a solo tour as far as i know, but he does do solo CDs. And he's backed up Ringo on one of his tours and Dan Fogelberg on one of his tours. Timothy also wrote "I Can't Tell You Why" with Henley and Frey. So with timothy on board for some high vocal parts, we were ready to begin recording. We tried to keep the essence of each of the songs, though we felt free to rearrange them based upon our particular gifts and taste. Some of the songs are close to the original Rolling Stones songs, but most are quite a departure. The bottom line is we love these songs and we love playing them. We respect the material and that is clearly evident throughout the recording. We think that this recording will give an even broader appreciation for Mick Jagger and Keith Richards songs. John and I shared the lead vocals and the tracking guitars, and created the background vocal parts. We then called Timothy in to add his wonderful tenor on "As Tears Go By" and "Last Time." "19th Nervous Breakdown" is John's tour de force. It was his idea to be a little freer with this one than any of the others and he came in with all the vocal parts laid out. I was utterly blown away. We then called upon Scott Breadman (The Rippingtons, Lindsay Buckingham, Jose Feliciano) to do percussion and Ken Lyon (Evan Dando, The Lemonheads, The Divinyls) to play fretless bass. Because Ken was on tour, we ended up with four bass players on the cd: Ken, Colin Cameron, John and me. But the bulk of the cd is Ken Lyon. After the parts were down, John and I poured over them for weeks, making certain that everything was just as we wanted it. This was the most grueling part of the process, but the result is one of the most wonderful recordings I've ever been associated with. And for those of you who know me, you are fully aware that I've loved them all. Now it was time for us to lay in the solos. I did several and so did John, but I thought that it would be fun to get some other musical voices in here. Listening to the tracks, I realized that we needed something swampy and soulful to set the mood, so i called Paul Barrere of Little Feat and asked him to do some slide on "Satisfaction" -- there is no one who plays like Paul. I then asked old friend and remarkable acoustic guitar soloist, Laurence Juber, (who also did two years with Paul McCartney and Wings and who now makes fantastic solo guitar CDs) to give us a solo on "Paint It Black" and my oldest and dearest friend, Peter Tork of The Monkees, Two Man Band and Shoe Suede Blues to play a solo on "Let's Spend the Night Together." The results were real magic. Neither John nor I have ever done a recording of someone else's material. More importantly, Jagger and Richards are two of the greatest rock composers of all time. The Stones have always been regarded as a great band, but few have acknowledged how great the Mick Jagger and Keith Richards songs are. 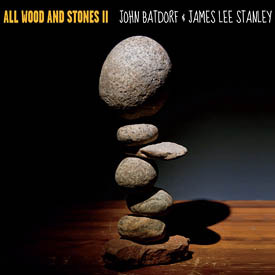 We love these songs and John and I had a grand time creating All Wood and Stones and we hope that the recording will give you all the same joy that these songs have given us through the years. 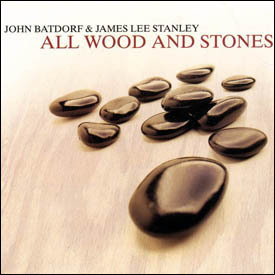 In 2004, James Lee Stanley and I got together and recorded our first CD together, All Wood And Stones. The CD was released in the fall of that year and much to our surprise, became an instant radio hit for us. This was going to be a one time thing and James and I would go back to doing what we did before the project was begun. We were never going to be an act, let alone a touring act, but one thing led to another and by popular demand, off on the road we went. Flash forward 8 years and lo and behold after 8 years of touring this CD, we decided to give it another try. We just didn't know what music direction to take. We kicked around doing California Gold, Steely Dan, Stevie Wonder, even a tribute to the great Motown hits but nothing seemed seemed to be right. 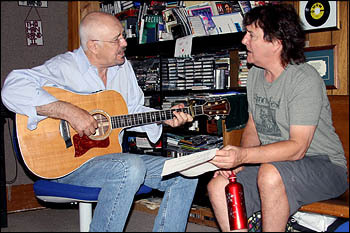 I was sitting with James in his studio and I said, "Hey, what about doing the Stones again?" James said, "Wow, I just got chills, let's do it!" We worked so hard to find 11 songs that worked acoustically on the first CD, that we thought at first that it would be impossible to find another half dozen more that would work but we were wrong. There was a difference this time. When we did the first CD, we just got together and worked on arrangements and recorded them. After touring off and on for 8 years, something had changed. There was a different synergy when we worked out arrangements for the new songs. We weren't afraid to be more aggressive and even used drums on this CD, where the first CD only had percussion and light at that. We chose raunchier songs like "Honky Tonk Women," "Jumpin' Jack Flash" and they worked great. The funny thing is, we tried those songs for the first CD but I just don't think we were ready for the challenge, but after eight years of playing together, these songs came easy. The CD is a natural progression from the first more laid back All Wood and Stones. Unlike the first CD, where we made the decision to use several celebrity artists including Timothy B. Schmidt and Peter Tork to name a few, we only used a drummer Tom Walsh and two bass players, Bill Batstone and Chad Watson. We were very confident in being able to accomplish what we wanted with just the two of us and the rhythm section mentioned above. We also recorded the CD differently. The first CD was recorded mostly at James' studio. This time, once we had the arrangements, we recorded our individual basic guitar parts and lead vocals at our own studios to save time. Once we had the guitars and lead vocals done, we decided to record and mix everything else at my studio. I bought a great new Pearlman Microphone for this project and once James and I worked out the harmonies we decided to try something new. We opened the mic up and sang our individual parts at the same time which really forces you sing your part great. Unlike recording your parts which can be doctored to work, this technique brought a whole new energy to the background vocals which was really great. Both James and I really stretched our talents to new heights. I believe we sang and played better than we have ever done before. So in a nutshell, in our opinion, this is the best album either one of us has ever done and we think you will too!